Wind Blocker Shades are made in the UK by Lillypad Leisure, a family firm based in the north of England. 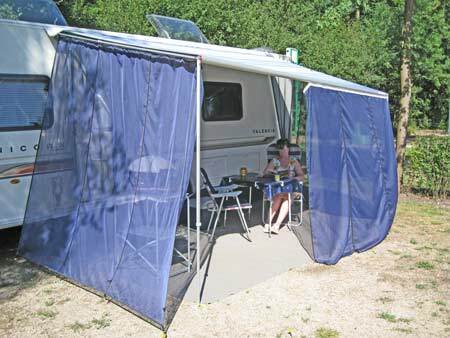 If you have a caravan or motorhome that has a wind-out or a roll-out canopy, do you take a weighty bag with side and front panels to convert the canopy into a “room style” awning? Would you like to have some protection against the wind that only takes a few minutes to set up, that is lightweight and very compact? You need a set of Windblockers. Plus you could win a set of Windblockers if you click the competition link at the bottom of this article (ends May 30th 2012). They are made from very light polyester voile; here’s a fascinating piece of information as it’s the same fabric the Dutch use when cultivating bulbs or growing flowers, as the material lets light and air diffuse through gently so not to upset delicate blooms and flowers yet allows you some privacy and doesn’t limit the view of your surroundings. You can purchase just a front panel; it slides into the channel on the edge of your canopy or one or two side panels; in fact any combination of panels that suits you. A front and side panel gives you a cosy corner and with side and front panels you can have your own “room style” awning but without the weight; will you believe me when I tell you that a full set of panels weighs around 3kgs and fit into a small bag. Another benefit is that you don’t have to fold them with scrupulous care to avoid damaging awning windows. So we think it’s win-win Windblocker. The side panels have elastic loops that slide over extending poles that fit between the canopy housing and the front channel of the canopy and the bottom of each panel also has elastic loops to peg them down. They do offer some protection against rain but in heavy rain and windy conditions you will experience some light spray. So now, what about the wind that comes under your caravan or motorhome? There is an answer for that too in the form of a lightweight draught skirt which attaches to a motorhome with self adhesive press-studs or slides into the skirt rail on a caravan. The skirts have enough depth to allow for having to use levelling blocks and you can complete the tidy draught proof look with a wheel arch cover if you want. Standard wind blocker sizes are made to fit 95% of motorhomes or caravans on the market but can be altered for those who require a different size and can as a special order be made to measure if you have an outfit that is an unusual size. Draught skirts are made to measure; the reason for this is to ensure the press studs are in the correct place for your unit. 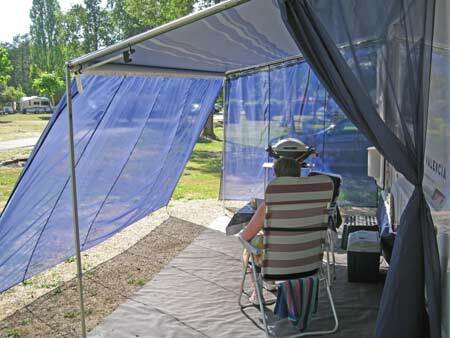 Please note that the blue Windblocker shown has extra long panels that are not standard. Win a set of made to measure Windblockers worth £150 (competition ends 30th May 2012). Click here to enter our free prize draw. (COMPETITION NOW CLOSED). Ian Benton from Newark was the lucky winner in our May ‘win a set of Wind Blocker’s’ competition. Ian wins a set of Wind Blockers including one front and two side panels made to measure for his touring caravan. Ian said “thanks for advising us of our prize which was very nice to hear.” Congratulations to Ian and his Wife and we hope the Wind Blockers make his future caravan trips even more pleasurable in the future. 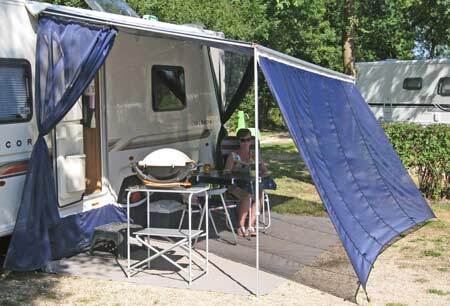 It’s difficult to say without knowing the exact size of your awning and motorhome. The best thing to do would be to contact the manufacturers, Lillypad Leisure on 08452305260. If you give them your exact measurements they should be able to tell you which shades are best suited to you. Alternatively, there’s a ‘how to measure tool’ on their website which should help, click here to take a look. Over wintering in Spain we have found Windblockers have eliminated the cool breezes that occur at this time of year. We have been able to sit out and enjoy warm sunshine through December and January, sheltered from the wind. I have used rigid poles to support the end Windblockers and wound the canopy in to trap these poles. Ratchet straps were used at each corner. The middle of the awning was supported by one of the adjustable poles supplied by Windblockers, and another ratchet strap was fixed alongside this pole. We have had gusts of 40km/h without incident. Hi sorry for the delay in responding. We had an issue with the alerts telling us people were posting on the blog. The Lillypad Leisure website says that a full set of Windblockers weighs 2 kilograms plus the 2 poles at 500 grams each. What a clever idea!! Quality looks good, I will have to have a measure and see if they will fit my 2007 Auto-Sleeper Windsor Transit motorhome.